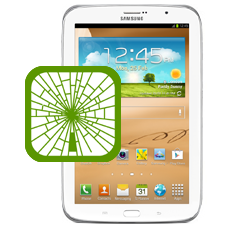 Have you broken your Samsung Galaxy Note 8.0 screen? If so we can repair your tablet. If your Samsung Galaxy Note 8.0 looks like it has a cracked, broken or shattered display and or broken touch screen this is the repair service you will need. A broken screen is classed by Samsung as a non-warranty repair and they will charge you accordingly. Our Galaxy Note 8.0 screen repair service is a cheaper option and performed to exacting standards, using genuine original Samsung parts. * Price includes a brand new Galaxy Note 8.0 touch screen and LCD display, fitting and fully insured return shipping in the UK. This is an in-house Samsung Galaxy Note 8.0 screen repair service, when ordering this Galaxy Note 8.0 screen repair service you are required to ship the tab into our repair centre for works to be completed. Yes it includes complete screen replacement, glass, digitiser, and LCD. Our in house Samsung Note repairs take 2 - 4 working days.